Customer Service. That is the number one priority for any business. Without customers, you don’t have a business. You have to be willing, and eager to serve the customers that visit your business. This includes before, during and after a purchase. Mike Sikora’s Dayton Home Improvement places customer service and customer satisfaction above all else. That is why over 70% of our customers are referrals and repeat customers. Our customers know that their neighbors, family and friends will get the same great product, installation and customer service they got, so they are very willing to recomend us. A Google Search for Dayton Home Improvement will show you that Mike Sikora’s Dayton Home Improvement has more 5 star ratings that any other contractor in Southwest Ohio. Satified customers are the cornerstone of business success. Every great customer service experience adds to the positive stories our customers pass on about us. 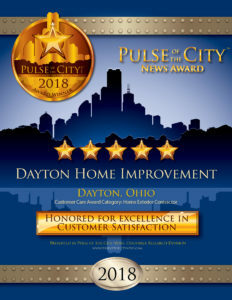 Dayton Home Improvement will continue to the tradition of providing the highest level of customer satisfaction with every detail of the home improvement process. If you have not had the opportunity to experience our award winning customer service, please take a look at the products and services we offer. We would love to have you spread good stories about us too.